Sanibel, a barrier island west of Fort Myers, is famous for the abundance of seashells that wash ashore on its beaches and for being a pioneer in open space preservation. One of Sanibel’s winter residents was J.N. “Ding” Darling, a world-famous editorial cartoonist, influential conservationist and founder of the National Wildlife Federation. In 1945, Darling stopped a pending land sale on the island and convinced the US Fish & Wildlife Service to lease bay-side wetlands from the State of Florida, creating the Sanibel National Wildlife Refuge (NWR). When Darling died in 1962, the islanders formed the Ding Darling Foundation. Thanks largely to the Foundation, the U.S. Fish & Wildlife Service now owns 6,400 acres, including 2,800 acres designated as wilderness, and the refuge is considered one of the top bird-watching destinations in the United States. To recognize his leadership, in 1967 the refuge was also renamed the J.N. “Ding” Darling National Wildlife Refuge. The J.N. 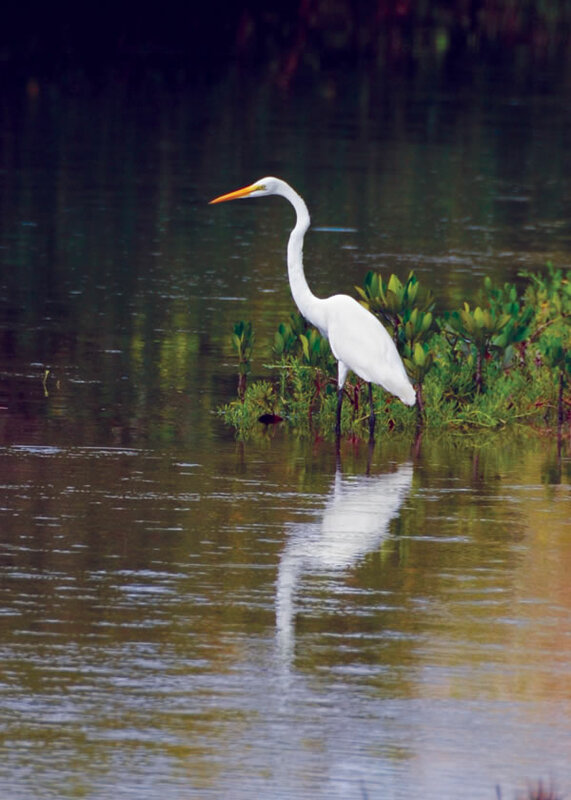 “Ding” Darling National Wildlife Refuge, on Lee County’s Sanibel Island, has become one of the top bird-watching destinations in the United States. After securing the wildlife refuge, islanders next formed the Sanibel Captiva Conservation Foundation (SCCF) to protect other fragile resources from the island’s soaring popularity. Shortly after Sanibel’s incorporation in 1974, SCCF helped prepare the new city’s groundbreaking comprehensive plan and land use regulations, which instantly became a national model for achieving sustainability and resource protection. SCCF also began protecting land directly and today has secured 1,800 acres within 89 preserves including a nature center with four miles of trails. In total, an impressive two thirds of Sanibel is now permanently preserved. On the Lee County mainland, a group of high school students and their teacher, Bill Hammond, were studying wetland ecology in 1976 and realized that a place called Six Mile Cypress Slough was seriously threatened by logging and development. They started a campaign to save this endangered oasis and preserve it as a living classroom where visitors could learn about the benefits of wetland ecology while catching a glimpse of bobcats, river otters and an array of birds including the occasional wood stork and roseate spoonbill. The voters responded by agreeing to increase their taxes, buy the 2,200 acres and protect it as the Six-Mile Cypress Slough Preserve, which officially opened in 1991. In addition to Six Mile Cypress Slough, Lee County used $9 million in property taxes to preserve roughly 9,000 acres in the Corkscrew Regional Ecosystem. Between 1990 and 1994, Lee County also bought land through its Sensitive Lands Inventory and Protection Program. In total, prior to adoption of the Conservation 20/20 Program discussed below, Lee County preserved roughly 11,500 acres in ten preserves with the help of the Florida Communities Trust, Greenways and Trails and Save Our Rivers. In 1995, Lee County voters reconfirmed their commitment to conservation by approving a tax on assessed property value capable of generating $119 million exclusively for open space preservation. As of 2008, the Conservation 20/20 program had preserved 20,766 acres in 37 preserves including the 3,136-acre Wild Turkey Strand Preserve, the Gator Hole Preserve and Cayo Pelau Preserve, which consists of an entire, small island in Gasparilla Sound. The largest of the Conservation 20/20 properties is the 5,620-acre Babcock Ranch Preserve, which is part of a huge, protected, working ranch that extends into Charlotte County. Over 100,000 acres of mangrove forests, sea grass beds, oyster bars, tidal flats and salt marshes in Lee County are protected in the Estero Bay, Matlacha Pass and Pine Island Sound state aquatic preserves as well as a portion of the Gasparilla Bay Aquatic Preserve. These preserves are home to a wealth of rare and endangered species including the Florida manatee as well as loggerhead, leatherback, green, hawksbill and Kemps ridley turtles. The State of Florida also maintains another 46,945 acres of land in four state parks, including Cayo Costa State Park, an unspoiled barrier island accessible only by boat with nine miles of sandy beaches.